These muffins are the second of many adaptations of "Classic Drop Biscuits" in Elana Amsterdam's book, The Gluten Free Almond Flour Cookbook. 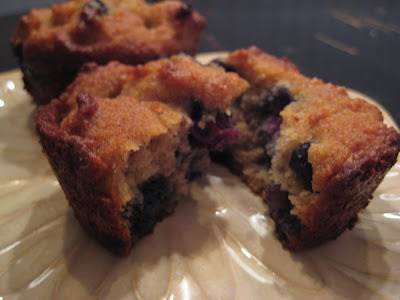 I added blueberries, cinnamon and water and used honey instead of agave nectar. The muffin consistency is reminiscent of "real" flour muffins! Blend the wet ingredients into the dry ingredients. The batter will be thick but not too dry. Add more water if needed. Fill a greased muffin tin 1/2 full with batter. Bake 20-25 minutes, makes 12 scrumptious muffins. I would double the sugar and then they might be just about perfect. I used Agave nectar instead of honey. I might double that and then eliminate the water next time around. The texture was wonderful. They looked great. Thanks for sharing!